"41AN26 - 120" by Timothy K. Perttula and Robert Z. Selden Jr.
DECORATION (INCLUDING MOTIF AND ELEMENTS WHEN APPARENT): The rim panel is defined by single upper and lower horizontal engraved lines with either downward- or upward-pointing excised tick marks. On the panel are three sets of hooked arm elements, each with four curvilinear engraved lines; the outermost line has outward-pointing tick marks. The hooked arm elements are divided by three sets of four closely-spaced near vertical and arcing engraved lines; the outermost line has outward-pointing tick marks. The vessel body has horizontal and overlapping brushing marks. Patton Engraved, var. 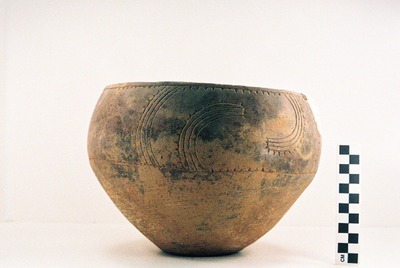 Patton carinated bowl from the Richard Patton site.